The Loneliness Of the Smart Phone User? I’ve seen links to images by American photographer Eric Pickersgill a few times now on social media. He took photos of people looking at their smartphones but removed the phones. It’s supposed to highlight now strange and lonely smart phones can make us, how we can be in the presence of friends, family or lovers yet be isolated from them by mutual screen addiction. Take a look at the pictures and see what you think. Then, imagine that instead of replacing the phones in these people’s hands, we put books there instead. Would we consider a couple snuggling on the sofa together reading to be sad and distant from each other? Would we shudder at the sight of three young brothers all reading books? The book readers are no more likely to be interacting with each other than the smart phone users but few people would criticise them for their page hours. Books are old and good, phones are new and bad. But I’d bet people once said the printing press would drive families apart. I find the idea that modern technology makes us less social very odd. Of course there needs to be limits, we try to eat meals as a family around the table and phones are banned. My husband is no doubt raising a sardonic eyebrow at this post as I often tell him off for staring at the phone when I’m trying to talk to him. But overall, smart phones, tablets etc. help me to communicate more, not less. Here’s a few examples from yesterday, a pretty typical day. I had a few minutes for myself before the kids got up so I flicked through twitter, catching up with news and opinions from American. Not the global events that would be in the UK press too but the smaller things that were interesting people while I was asleep. 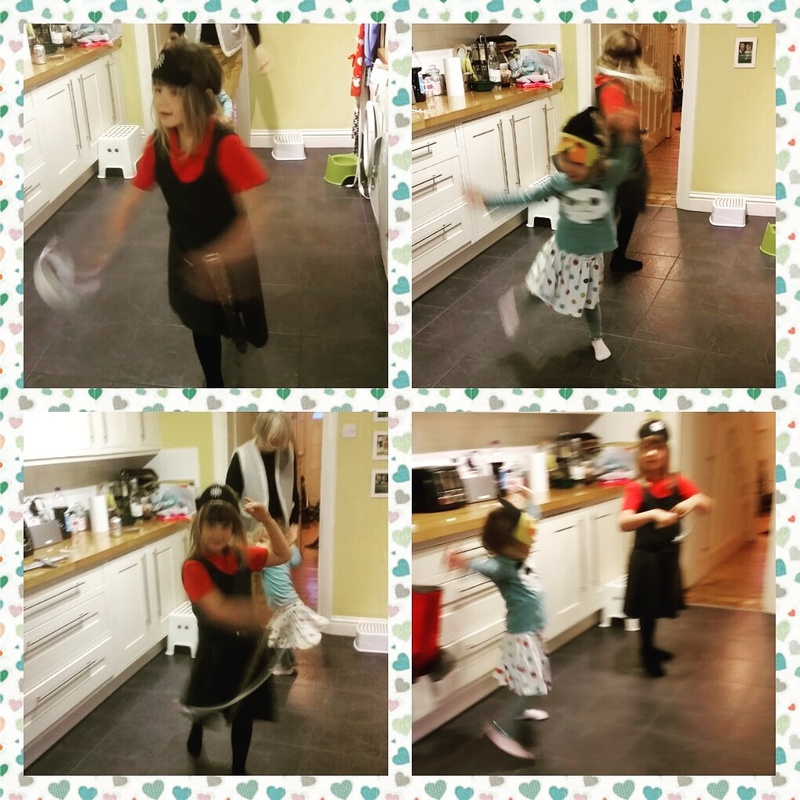 After breakfast the girls were dancing around the kitchen so I took a few pictures on my phone and made a quick collage of them on Instagram. They are mostly blurred, but they meant that my Mum, who lives five hours away, would get a peek at what her grandchildren were doing that very day. At work I was watching a very dull experiment when I got a lovely message on WhatsApp from a colleague who works different days to me. She sent a picture of a meal she’d cooked, thanking me for the recipe and arranging to pop round to my house at the weekend and return some baby things I’d lent her. At lunchtime I only had time for a quick break on my own, so I flicked through Facebook and saw pictures of a friend’s children playing in her house, she lives in Australia now and I’ve not met them all. I ran home from work with my phone stuffed in my bag but was still able to take a call from my husband, thanks to my bluetooth headphones. Afterwards I used my smart watch to send him a link to my phone’s GPS. It meant he knew exactly when I’d be home and that it would be worth keeping the kids up so I could read them a bedtime story. At the end of the day I curled up on the sofa with my husband and we watched a film, streamed to our TV and controlled by an app on his phone. None of this is big interesting stuff, it’s just the mundane everyday business of life. If everyone you know and care about lives in the same village as you then smart phone communications probably don’t matter. But like so many people my loved ones are spread around the world, keeping in touch with them was the main reason I started blogging. Without my smart phone and laptop I’d still probably hear about the big things, the marriages, deaths and babies but I wouldn’t get to share the everyday details of life. The silly poster someone spotted or the friend who’s had a bad day at work. I wouldn’t get to read interesting articles from writers all over the world in publications I may never have heard of. My parents wouldn’t be able to see their grandchild via skype, jumping about in her fancy dress costume. I wouldn’t have met many wonderful, fascinating and diverse people through online groups and discussions. Technology can come between people, but it can also bring us together, shrinking the barriers of geography and time zones. It can be lonely, being at home with only very young children for company, waiting for yet another delayed commuter train or living many miles from all your family. But with my smartphone in my hand I always have friends a few taps away. My village is global but I carry it in my pocket. Previous: Previous post: Acupuncture For All – On the NHS?